The 1995 Ducru is wonderfully hedonistic, exhibiting blueberry, raspberry and cassis flavours with mineral, spice and new oak nuances. A compelling wine drinking 2005 to 2030. Subtle yet aromatic character of Indian spices, currants and dried cherries. Full-bodied, with super well-integrated tannins and a long, caressing finish. Wonderful texture. Classy and structured. Long. 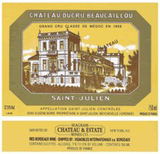 This was wine of the year in 1998; well deserved.--'95/'96 Bordeaux retrospective. Best after 2009.